Pentax Ricoh has announced the successor to the GR IV. Simply named the Ricoh GR, the new camera features a 16.2 million pixel APS-C sized sensor but still keeps a reasonably small body size. Along with the new sensor is a newly developed lens. The 18.3mm f/2.8 lens is roughly equivalent to 28mm in 35mm terms. Pentax Ricoh claims that the lens minimises distortion and chromatic aberration by incorporating two high-precision aspherical lens elements and a highly refractive low-dispersion glass element. It also has a nine-bladed diaphragm to produce a rounded bokeh effect at larger apertures. A manually adjustable inbuilt ND filter is also included to allow for wider apertures in bright light. Pentax Ricoh says that the lens has been optimised for the APS-C sensor. The camera, like the Nikon Coolpix A, has also had the anti-aliasing filter removed, which should enhance performance. A high-speed autofocusing system promises speeds of 0.2 seconds, while a start-up time of just one second is also boasted. Continuous shooting is available at up to 4fps. Despite the increase in sensor size, the Ricoh GR boasts a body that's not too much larger than the Ricoh GR IV, which has a 1/1.7-inch sensor. Other improvements include an increase in the number of digital filters, an upgrade to the precision of automatic white balance and Eye-Fi compatibility. 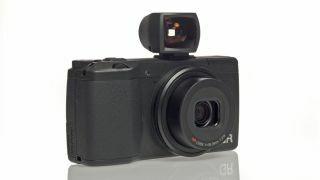 The Ricoh GR price will be around £599 (approximately US$920 / AU$882) and will be released onto the market in May 2013.